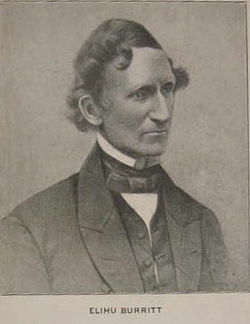 Elihu Burritt was an American philanthropist and social activist. He was active in many causes, namely opposing slavery, working for temperance, and trying to achieve world peace. These accomplishments caused President Lincoln to appoint him as a United States consul in Birmingham, England. He published more than 37 books and articles, including Sparks from the Anvil and Ten Minute Talks. In 1847, his pamphlet Four Months in Skibbereen made residents of the United States more aware of the Potato Famine in Ireland. He possessed an extraordinary aptitude for languages which allowed him to attain his marvelously rapid mastery of them. He first trained as, and followed the occupation of blacksmith. His remarkable mental traits in combination with his continued pursuit of the blacksmiths' craft (particularly when short of cash) earned for him the title "Learned Blacksmith."